There are those who confuse freedom with choice. They do not realize that freedom is the ability to choose the means to a determined end perceived as good and in accordance with our nature. It is not the choice itself. When a person makes a bad choice or chooses a bad end, the result is not freedom but a type of slavery to the passions. Thus, a person who overeats when satisfying natural hunger or another who chooses an excellent wine with the intent of getting drunk, does not exercise true freedom but rather its abuse. The more we master our nature, the more freedom we have. Supernatural virtue gives us yet more freedom since we not only master our nature but surpass it. 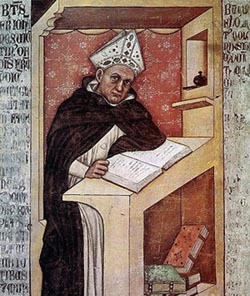 Saint Thomas teaches: “But man is by nature rational. When, therefore, he acts according to reason, he acts of himself and according to his free will; and this is liberty. Whereas, when he sins, he acts in opposition to reason, is moved by another, and is the victim of foreign misapprehensions. Therefore, ‘Whosoever committeth sin is the slave of sin’” (quoted in Leo XIII, Encyclical Libertas  in The Papal Encyclicals, vol. 2, p. 171, no. 6). 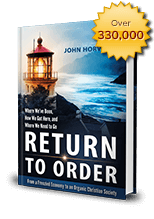 The above excerpt was taken from the book, Return to Order. This entry was posted in Featured and tagged America, Catholic Church, Christian principles, consumer society, consumption, false happiness, Family, frenetic intemperance, honor, leadership, Return to Order by John Horvat II. Bookmark the permalink.